The ‘Giant Rule’ wooden height chart is a handmade, personalised wooden growth chart, designed as a giant modern wooden ruler by Little Miss Viking. Any text you would like to personalise the height chart with. Eg "Our Growing Family", "The Smith Family Rules"
Our wooden height charts are family heirlooms in the making. They make original personalised unisex gifts for Christmas, new arrivals, christenings, first birthdays, best of all they can move house when you do – no more lost history! By personalising them with a family name (rather than the child’s), they can still be enjoyed if further new additions arrive later on. Being a stylish home accessory as well as being practical, the ‘Giant Rule’ wooden height chart does not have to be hidden away in a child’s bedroom or nursery and instead can be a centrepiece to the home in a hallway or kitchen. A great family keepsake, this pine height chart is the perfect way to keep track of your growing family. 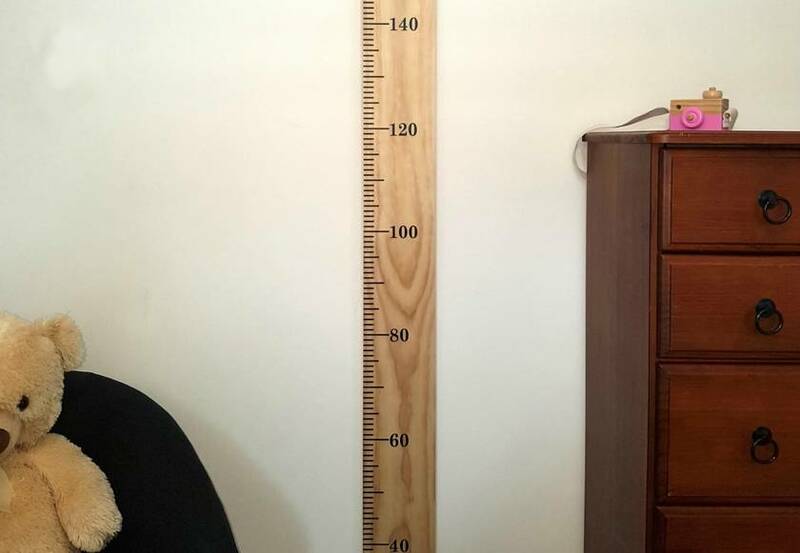 The wooden pine height chart is marked from 20cm to 200cm and is designed to be installed 20cm off the floor enabling plenty of room for skirting boards. Contact littleviking to enquire about payment or shipping options.